2019 Toyota RAV4 vs. 2019 Ford Escape: Which Is Better? The aging Ford Escape can't compete with the excellent new Toyota RAV4. 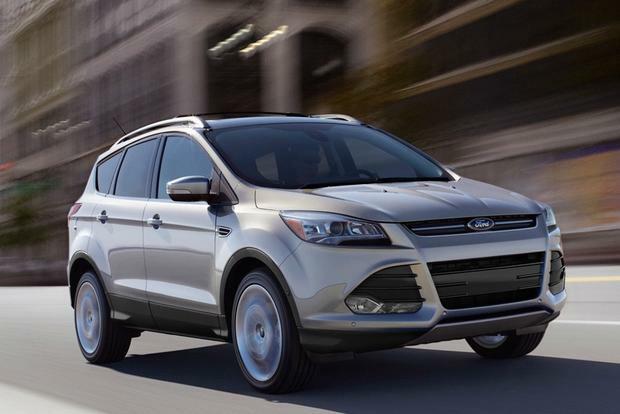 2019 Ford Escape vs. 2019 Ford Edge: What's the Difference? The all-new ST trim further sets the Edge apart from the Escape. The 2013 Ford Escape compact SUV is fun to drive, fuel efficient and loaded with features, but is it a better choice than a used Honda CR-V? Sleek and feature-rich, the 2014 Ford Escape SUV is a tempting used-car choice with a less-than-enviable repair and recall history. The 2014 Ford Escape compact crossover SUV combines sporty good looks with cutting-edge technology, appealing engine options and a high fun-to-drive factor. The Escape also offers features found in no other compact SUV in this price range, including a rear cargo door that opens automatically when you wave your foot under the bumper. The Escape can even parallel park itself. And whether you're hauling people or stuff, you'll find the roomy Escape to be an exceptionally accommodating companion. The Escape receives minor equipment updates this year, including standard SYNC and a rearview camera across the board. Also, the 2.0-liter turbo engine is no longer standard on Titanium, which comes with the 1.6-liter turbo out of the box and offers the 2.0 as an extra-cost option. The entry-level Escape S is powered by a 2.5-liter, 4-cylinder engine good for 168 horsepower and 167 lb-ft of torque, and fuel economy of 22 miles per gallon city/31 mpg hwy. A 6-speed automatic is the only transmission choice and all-wheel drive is not available. Next up is the SE and SEL. These use a 1.6-liter EcoBoost turbocharged 4-cylinder engine rated at 178 hp and 184 lb-ft of torque, and fuel economy of 23 mpg city/32 mpg hwy with front-wheel drive and 22 mpg city/30 mpg hwy with all-wheel drive. Optional on the SE and SEL and standard on Titanium models is a 2.0-liter EcoBoost turbocharged 4-cylinder engine with an impressive 240 hp and 270 lb-ft of torque, and fuel economy of 22 mpg city/30 mpg hwy with front-wheel drive and 21 mpg city/28 mpg hwy with all-wheel drive. Premium fuel is recommended for the EcoBoost engines. Using regular fuel will slightly reduce power to compensate for the lower-octane mix. 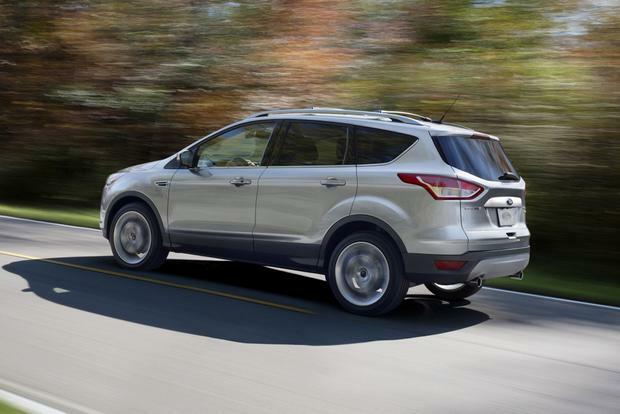 The 2014 Ford Escape is offered in three trims -- S, SE and Titanium. The base Escape S ($23,595) includes cruise control, air conditioning, a rear windshield wiper, a rearview camera, the SYNC voice-command system, Bluetooth, a 6-speaker stereo with an auxiliary input jack, the MyKey programmable key fob (which lets parents set limits on radio volume and top speed) and 17-inch steel wheels with plastic covers. The SE ($26,445) adds 17-in alloy wheels, exterior keypads for the door locks, satellite radio, a power driver seat with lumbar adjustment, heated front seats, reclining rear seats, fog lights, automatic headlights and the turbocharged 1.6-liter EcoBoost engine. 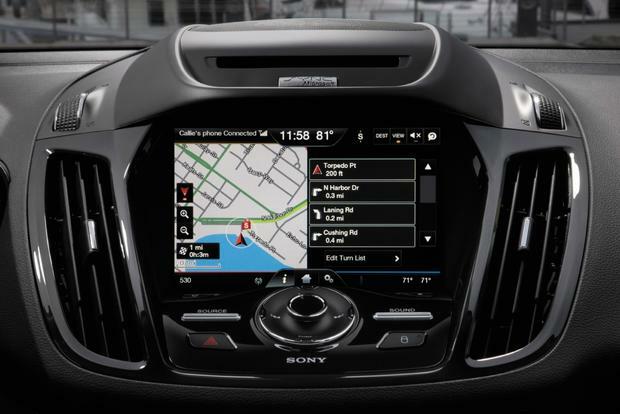 Options for the SE include a panoramic glass moonroof, voice-activated navigation, a power cargo door with motion-sensing activation, 18-in alloy wheels, dual-zone automatic climate controls, upgraded Sync with AppLink smartphone integration, and MyFord Touch with an 8-in touchscreen, a 9-speaker audio upgrade, dual USB ports and an SD card reader. The Titanium ($29,995) tacks on most of the SE's standard and optional niceties along with keyless entry/start and Sony audio with 10 speakers. Options include the 2.0-liter EcoBoost engine, parking sensors, bi-xenon headlights and a blind-spot warning system with cross-traffic alert. The Titanium can also be equipped with a nifty automated self-parking system that takes the guesswork (and effort) out of parallel parking. All-wheel drive, available on SE and Titanium, costs an extra $1,750. Every 2014 Escape has Ford's Personal Safety System and Safety Canopy System, which includes side-impact airbags in front, side-curtain airbags and a driver-knee airbag. Four-wheel anti-lock disc brakes with stability control help keep the Escape moving in the direction you intend even when things get slippery. The Escape earned four out of five stars in government crash tests, including four stars for frontal impacts and five stars for side impacts. 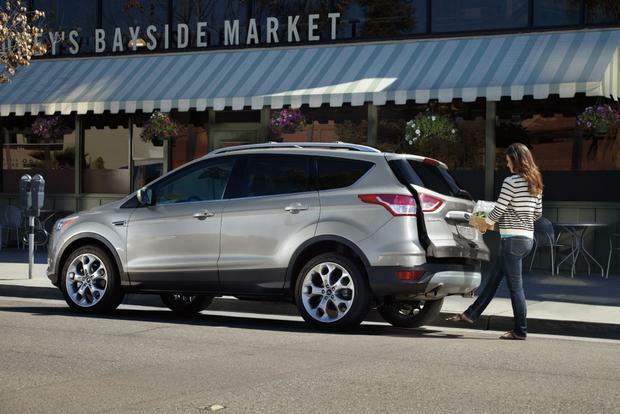 The 2014 Escape's body is rigid and tight over bumps, without any squeaks or rattles. The seats feel a bit narrow but are supportive and comfortable. 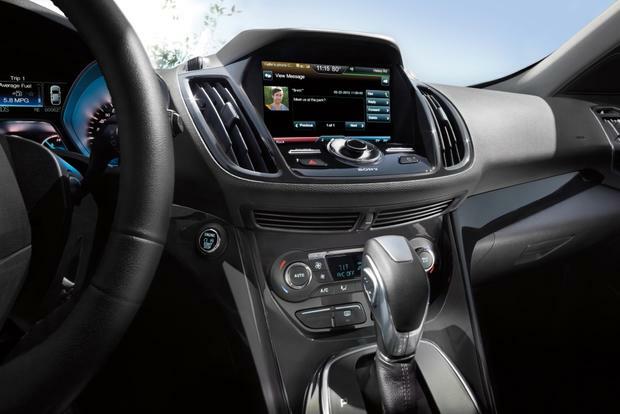 At highway speeds, the Escape's cabin is remarkably quiet. 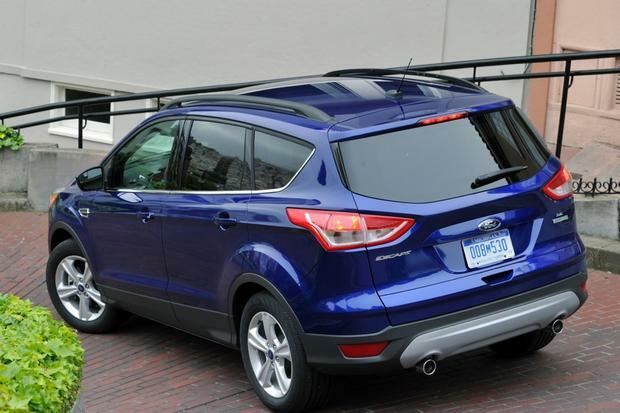 The Escape's taut suspension settings give this little SUV a sporty demeanor, not unlike the related Focus hatchback. We like the ride on the SE and SEL, but found the Titanium's larger 19-in wheels had a tendency to magnify road imperfections. The base 2.5-liter engine is competent enough, but it's the EcoBoost engines that really make the Escape zip along. We found the 1.6-liter engine more than satisfying in both its power delivery and fuel consumption. The Titanium's optional 2.0-liter turbo is a brute, and those accustomed to having a V6 will want this option. Honda CR-V -- Considered by many to be the gold standard in compact crossovers, the CR-V has a well-deserved reputation for reliability and resale, two areas where the new Escape has yet to prove itself. While the CR-V can't compete with the Escape's engine and technology offerings, even a fully loaded EX-L model barely crosses the $30,000 mark. 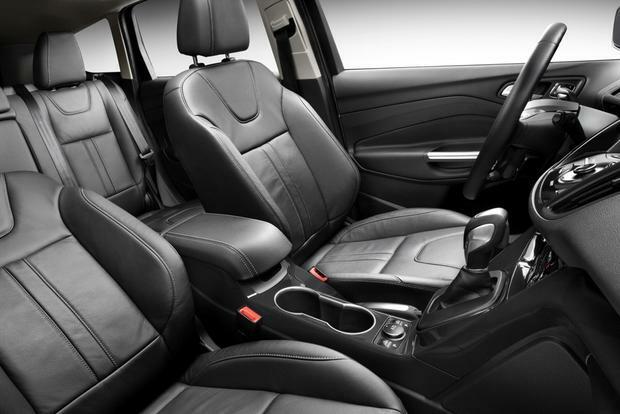 Toyota RAV4 -- The RAV4 has more interior room and there's even an all-electric model, the RAV4 EV (based on the old RAV4). The RAV4 is also projected to hold its value better than the Escape, and it gets better fuel economy in the city. Although it doesn't offer as many options, a loaded RAV4 Limited costs thousands less than a well-equipped Escape SEL or Titanium. Subaru Forester -- The Forester doesn't handle as well as the Escape, but its resale numbers still trump just about everything in this class. The Forester's turbo model has even more power than the Escape's 2.0-liter. While we love all the extra tech goodies in the Titanium model, its price seems at odds with the reason most people buy a smaller SUV: affordability. We think the SE trim with the 1.6-liter EcoBoost engine is the best choice. Adding all-wheel drive still keeps the price well under $30,000.